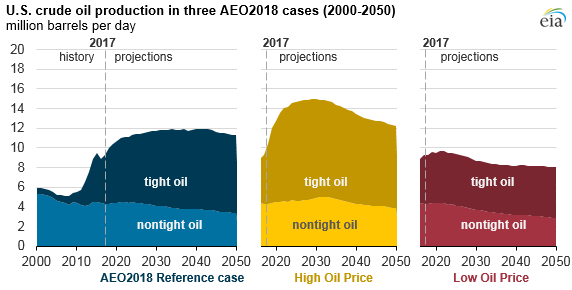 EIA’s recently released Annual Energy Outlook 2018 (AEO2018) Reference case projects that U.S. tight oil production will generally increase through the early 2040s, when it will surpass 8.2 million barrels per day (b/d) and account for nearly 70% of total U.S. production. Tight oil production made up 54% of the U.S total in 2017. Development of tight oil resources is more sensitive than nontight oil to different assumptions of future crude oil prices, drilling technology, and resource availability, but tight oil remains the largest source of U.S. crude oil production in all of the AEO2018 sensitivity cases. Recent growth in U.S. crude oil production has been driven by the development of tight oil resources, primarily in the Permian Basin. Three major tight oil plays in the Permian Basin—the Spraberry, Bone Spring, and Wolfcamp—accounted for 36% of U.S. tight oil production in 2017. Production from these three plays is projected to increase and to account for 43% of cumulative tight oil production through 2050 in the Reference case. The Bakken and Eagle Ford formations remain major contributors to U.S. tight oil supply through 2050, accounting for 20% and 17% of cumulative tight oil production in the Reference case, respectively. 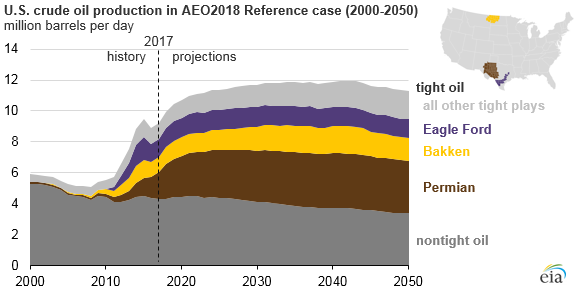 In the AEO2018 Reference case, tight oil production increases to 8.2 million b/d in the early 2040s and then remains relatively constant through 2050 as development moves into less productive areas. As a result, total U.S. oil production is expected to increase over the next 20 years, from 9.3 million b/d in 2017 to nearly 12 million b/d in the early 2040s, and then decrease slightly through 2050. However, future growth potential of domestic tight oil production depends on the quality of resources, technology and operational improvements that increase productivity and reduce costs, and market prices—factors with futures that are both interconnected and uncertain. AEO2018 includes several sensitivity cases that incorporate different assumptions regarding price, technology, and resource recoverability. The High Oil and Gas Resource and Technology case uses more optimistic technology and resource assumptions than in the Reference case under the same base world oil price assumptions. In this case, tight oil production increases throughout the projection period, reaching 14.6 million b/d by 2050, or 77% of total U.S. production, as higher productivity reduces development and production costs. In the Low Oil and Gas Resource and Technology case, which uses more pessimistic technology and resource assumptions under the same base world oil price assumptions, tight oil production still increases from its current level, reaching 5.6 million b/d in 2021, and then decreases to 4.4 million b/d by 2050. Total U.S. oil production in 2050 in this case reaches 7.2 million b/d, which is well below the Reference case level of 11.3 million b/d. Oil production is also sensitive to prices. The AEO2018 contains two cases that assume higher and lower oil prices under the same resource and technology assumptions as in the Reference case. In the High Oil Price case, where West Texas Intermediate (WTI) spot prices rise rapidly and are sustained at higher levels, domestic crude oil production increases to nearly 15.0 million b/d by 2030, before declining to 12.2 million b/d in 2050. In this case, tight production reaches more than 10.0 million b/d in 2025 (double the 2017 rate of 5.0 million b/d) as higher prices increase the pace of drilling. Tight oil production then declines to 8.4 million b/d in 2050 as drilling moves to less productive areas. In the Low Oil Price case, sustained low oil prices still allow total domestic production to increase from 9.3 million b/d in 2017 to 9.7 million b/d in 2021 before gradually declining through the rest of the projection. Tight oil production is relatively flat through 2050, averaging near 5.0 million b/d, and accounts for 64% of total domestic oil production in 2050.